There is something about the look of pallet furniture that is so appealing. Not only does it look cool but pallets are also fairly easy to work with in making furniture. Plus, pallets are super cheap if not free! 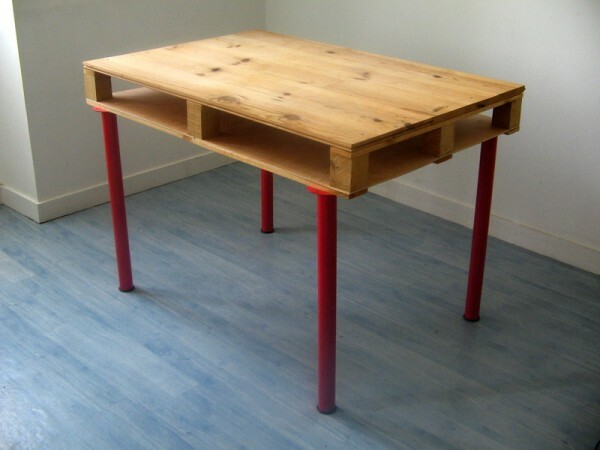 An especially useful piece of furniture to make is a pallet desk. 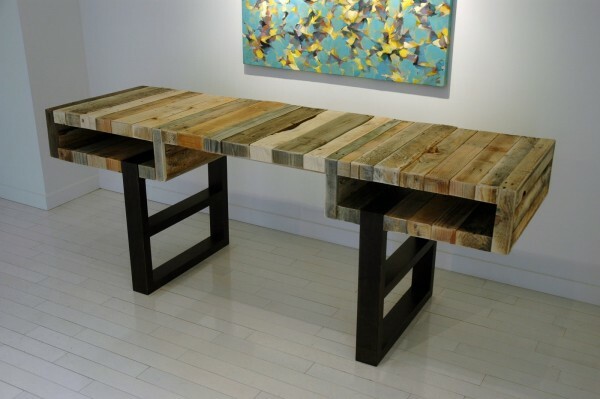 If you want to make your own, these pallet desk designs are sure to inspire you. The unique structure of a pallet makes it perfect in designing a desk. Because of the design of a pallet, you naturally get built in cubbies for holding supplies. 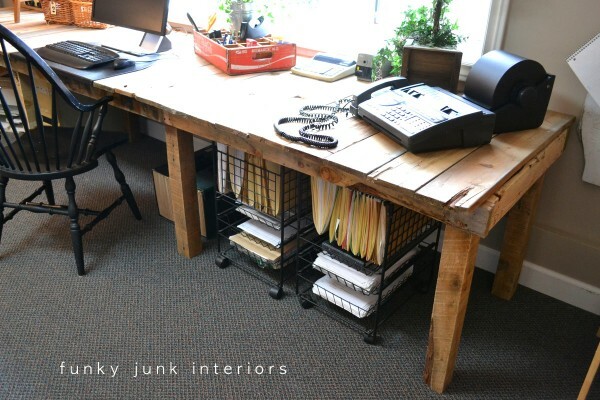 There are so many different ways to make a pallet desk that you can really customize one to fit your needs. This super simple design has the pallet simply mounted directly to the wall. Check out the tutorial for how to attach a pallet to the wall. The glass top gives a nice sleek work surface and you can see how the natural design of the pallet offers storage space under the work surface. 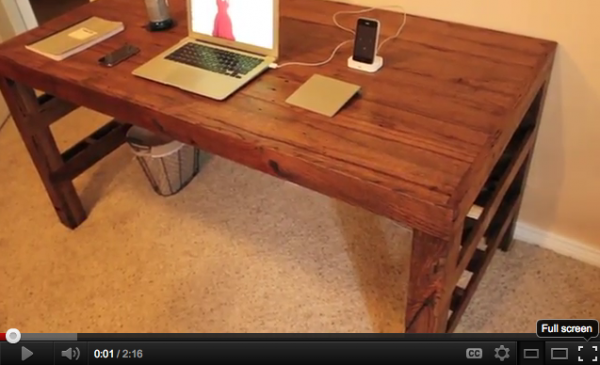 I am in love with this pallet top desk! The look is so shabby chic. This, of course, wasn’t just a matter of sticking a pallet on top of an existing desk. There was a little bit of re-work here. But, the pallet was free, the instructions are easy to follow and the result is soooo amazing! Here is another fun idea using legs from Ikea. Some additional wood, besides the pallet, was also used in this project. 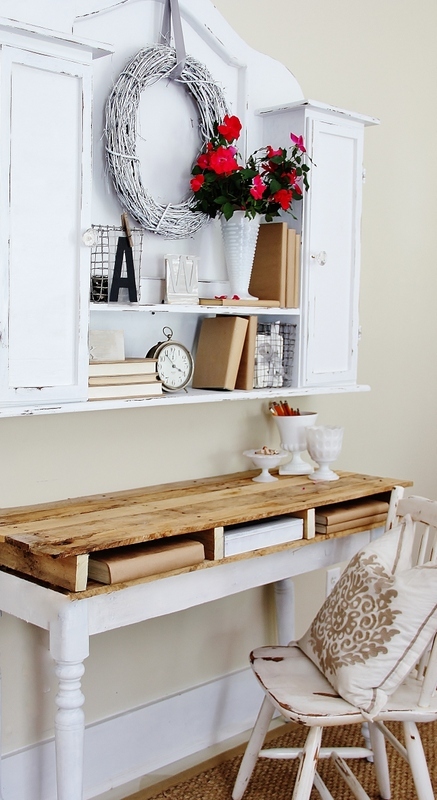 This gives the simple pallet desk a clean look. 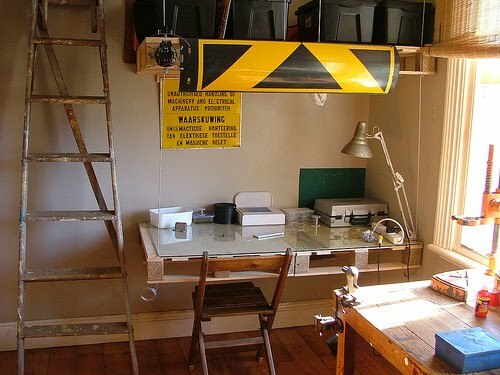 For a designer looking pallet desk like this, you may want to check you what Hall/Spassov did. To get the aged look of the pallets, they adhered them to stronger wood that was used to construct the desk. Wow! 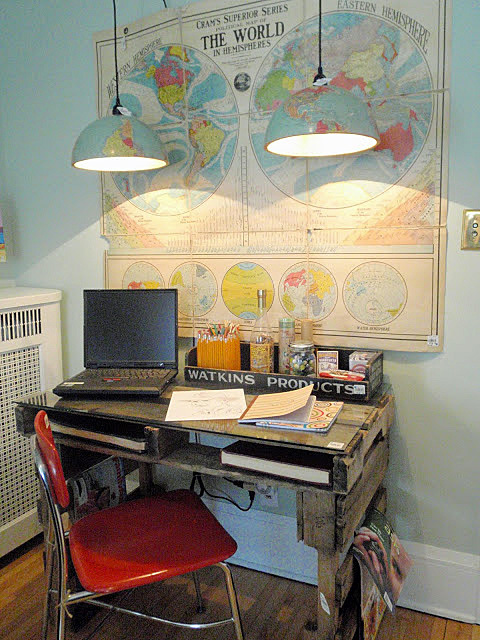 If you have the space, here is an awesome rustic long pallet desk design. I just love those chunky pallet legs and the cedar plank top! The industrial looking rolling file bins fit perfectly underneath. From rustic to a more sleek design, all you need to do is run the pallet boards through a planer and add some wood stain. Starting out with a good quality pallets helps too. For this desk, the pallets were all taken apart, put through a planer, and then reassembled into this desk design. The rich dark stain adds a warm sleek look too. And finally, this pallet desk is simply made with rough pallets and a glass top and it is absolutely perfect for a boy’s bedroom. Notice the great space for books underneath? No need to worry about this desk getting damaged. Those of you with boy’s will know what I am talking about! Although these pallets look fairly rough, you can ensure that the pallets are safe to decorate with. Would you consider one of these pallet desk designs? Have you used pallets in your home decorating? I really like a couple of these.